It’s that time of year again. After the success of the Coffee Spot Calendar over the last two years, I’m back with the 2016 Coffee Spot Calendar! As before, I’ve produced a professionally-printed A4 calendar on glossy paper. Each month there’s a landscape, A4 picture from one of my favourite Coffee Spots of the last 12 months. I’ve also produced a limited number of desktop calendars. This year, however, there’s an additional bonus: the Coffee Spot Lighting Calendar! Each calendar costs £12.00 (£15.00 for the Lighting Calendar) and, if you’re in the UK, there’s a flat fee of £2.00 postage and packing, regardless of how many you order. There are also discounts for multiple purchases. If you think we’re likely to meet up in the near future (I’ll be at the La Marzocco Generation Coffee event in London on this Saturday, 12th December), I’ll even waive the postage and hand your calendar over in person! For orders for Europe, the postage and packing is £4.00 for one or two calendars, while for the rest of the world, it’s £6.00. I apologise for the excessive postage charges, but this is what it’s costing me to send them to you! December 26: All the calendars are now SOLD OUT. However, you can still order them from me; what I’ll do is get the printers to send it direct to you. Unfortunately this means that I no longer get any volume discounts and so have to charge £15 for each wall calendar and £10 for each desktop one. The gallery shows the Coffee Spots that feature in the calendar. In each of the last two years, I’ve printed and sold 100 calendars, so this year I’ve taken the plunge had another 100 Coffee Spot Calendars printed, along with a smaller print run of 50 of the Lighting Calendars, both of which have sold out, along with both versions of the desktop calendar. You can still order them from me, but they will now come direct from the printers. 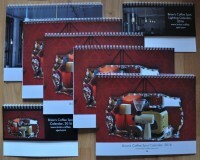 The Coffee Spot Lighting Calendar was designed with the help of my friend Sharon Reed, who has chosen most of the pictures (she let me pick three…). If you want to see what’s in the Lighting Calendar, check out the following gallery. Ordering your calendars is simple: just head over to the Coffee Spot shop, decide exactly what you want, then click the “Buy Now” button. If you want to order more than two calendars, drop me an e-mail and we’ll work out a price.